Marquette returned to the win column tonight with a 79-71 win over the DePaul Blue Demons in front of a record crowd of 19,037. 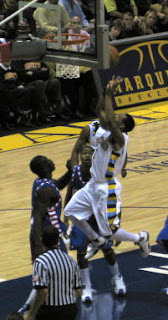 Dominic James led the Golden Eagles with 19 points. After leading by just a bucket at the half, MU poured it on in the second half building an 18 point lead before settling for the eight-point win. With the win, Marquette moves to 14-4 overall and 4-3 in the Big East. DePaul fell to 9-10 and 4-3. Jerel McNeal chipped in with 15 points and Lazar Hayward delivered 14. In an interesting twist, Crean started senior Dan Fitzgerald tonight rather than Dwight Burke. Fitz landed up with two points. Updates to follow. Talk about the win over at MUScoop. Next up for Marquette are the USF Bulls who stampede the Bradley Center on Tuesday night. An UGLY win. DePaul was really bad: 1/1 plays, no rebounding poor shot selection. Trend plays 0 minutes. Had to be a suspension. Still, a win, and we needed one. Suspension? Says who? Where did you hear/read that one? Based on how they played the last two games, and the fact DePaul was 4-2 coming in, I'll take it. I loved the fact that Crean was in all of their faces for that atrocious looking first five minutes, but as the game wore on MU built the lead, he was slapping Ooze and Acker and James getting their confidence back on the bench. That was good to at least see. That was James' game. in reality, it was good to see most of the guys come back and contribute something. Also good to see Acker back in teh second half after rolling the ankle to end half one. A good win. Not a great one, but typical big east ball. Burke and Ooze played better, especially Ooze. Last note, the DePaul 2-on-0 break in the first half w/a botched alley-oop off the backboard, and then a missed 0' put-back was high comedy. Crean'strategy regarding starting Fitz and only playing Ooze 12 minutes boggles my mind. Fitz is not a 5 and his contributions are very minimal. With a lead of about 15 points I think Trend, Patrick and Chris all should have gotten minutes. I think Crean's catch-as-catch-can recruiting surfaces even when we win. To me the team doesn't look like a happy group. That's a pretty subjective opinion about being a happy group. It was an intense, hard fought contest. Don't know if I would expect to see players looking like they were a happy group. But I bet they were happy about the win. MU is not shooting well. I think reading more into it is a mistake. They will get back to form and post a couple road wins before the end of the season. They'll be fine. If it wasn't a suspension, it was a very, very off DNP-Coaches Decision. Depaul's street game was meant for Blackledge, yet the Master of Motivation kept him on the bench for 40. Fitz played well though: 5th year senior looking totally lost on the court!!! Blackledge is 185 lbs and would have gotten mauled down low by their bigs. I think he should have played at least a couple minutes, but c'mon. Don't go throwing out crazy accusations just to make a name for yourself. Benching is one thing. Saying someone is suspended is all hearsay. As for Fitz starting, did you read Rosiak on Saturday? Crean pretty much said that both him and the rest of the team were calling out Barro and Burke. I don't think he had a choice otherwise he loses his team. Play the guy that's playing in practice. Lastly, regarding Fitz. He as much as anyone needs a boost in confidence and I got no problem w/him starting. Not like the other options were lighting it up. I was surprised how little Ooze played, considering he got 6 boards nad 4 pts in 12 minutes (vs. the awful Burke's 1 board in 13 minutes). And finally, I couldn't disagree more about the team looking "unhappy". THe bench goes nuts for everyone in the game. Even the starters. I think we're reading way too much into a team that lost two games prior to this one. A good hard fought win. Blackledge was the most effective against the ND post player, who had him by 70 pounds. But please accept my apologies: Speculation on a blog! Oh my, what's this world coming to?? Rosiak called out the DNP for Trend as well. NY Warrior - were you drunk when you wrote this article? No mention of Dominic James for MU although he led all MU scorers and played one of his most complete games of the year? What gives? "In an interesting twist, Crean started senior Dan Fitzgerald over Dwight Burke." In an interesting twist? Not only did Fitz start the last game against UCONN, but Crean has been juggling his frontline all season. Nothing was intersting about the move...Crean has been suggesting lineup tweakings all season until the rebounding picks up. I know you know all this, that why I'm asking if you were drunk. Mr. Anonymous, were you drunk when you wrote your comment? Dominic James' performance is covered in the second sentence of the report. Oh, we also included a photo of James. As for the Fitz mention -- he started a grand total of three games leading into DPU. Given Crean's rather direct comments about the performance of his bigs (Barro and Burke), one could figure that TC might have gone back to Burke to matchup against a stud like Koshwal. I think the Fitz start is worth trying. That St. Joe's team that made the final 4 run a couple of years ago had a similar line-up with no No. 5 player. I don't want to give up on Ooze, but don't mind trying the no center look as well. BTW, we all went to school in Milwaukee, who cares if a couple of people are drunk during posts? Anyone else notice Coach talking to Trend (and it seemed Hazel, as well) toward the end of the game? When the game was in hand, Crean crouched in front of Trend, pointed at him, and never patted him on the knee or shoulder. I point this out, only because Crean uses smacks and pats liberally. Note his reaction to Ousmane getting an offensive rebound and throwing the ball off a DePaul defender to save possession. Coach met Ous nearly at midcourt and practically tackled him. But during his discussion with Trend, there appeared to be little if any of that type of encouragement. And Crean committed to making his point, because he talked to him during a few minutes of live game action. Even after a timeout, he went back to finish his point. Good win. Glad to see us fight from behind after another slow start. DePaul indeed helped us out with their lack of organization. But a good win against a team many pegged as "on the rise." DePaul has much more talent that we do. I don't understand why they didn't lob it inside on every possession. Did anyone else notice that Fitz appeared to be holding something on his hip when on the bench? It was very noticeable whenever he stood up, looked like a hot pad or something? I missed the Fitz hotpad thing...must've been in the 2nd half when I, too, was getting drunk! It was a Saturday Night in Milwaukee after all. RE: Fitz holding something...I missed it, but didn't miss his black eye. Did Diener practice with the team last week? I think too many folks are drinking the Trend Blackledge kool-aid. He is a role player who doesn't always have a role.